By the Decree of the President of the Republic of Kazakhstan dated on March 1, 2013 №511 the festive date «Family Day» was set and is celebrated on the second Sunday of September. Family is the beginning of the best traits of human nature: the determination and will, kindness and strength, warmth and tenderness. The attitude to the elders, friends and saint – Motherland is formed there! 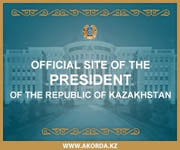 Congratulating all Kazakhs on the eve of the holiday, on the September 13th, Nursultan Nazarbayev, said: «The family is the core of Kazakhstan’s society, the basis of all new developments in our country’s economy, culture, social policy. Through strong family, from generation to generation passed all the best spiritual and moral values of our people — tolerance, generosity, love for his native land, respect for elders, hospitality and aspirations for the future. 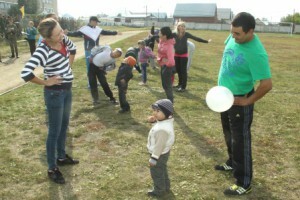 Family Day strengthens all of these qualities; youth passes key knowledge about the importance of responsible marriage, constant care of the children and the older generation.» «The welfare of each Kazakhstani family is a key goal of the implementation of the Strategy» Kazakhstan-2050 «, added the leader of the nation. Sunday morning, September 14, 2014 at the stadium of the military school of the National Guard of the Republic of Kazakhstan was crowded and noisy because the participants gathered for the festive competition «Dad, Mom, Me — sports family» — families of officers and soldiers under contract, many viewers from among the cadets fo the training battalions, soldiers and officers of the battalion of the security management, and the music played on the theme of family and sports. The competition consisted of seven stages: the original team name and slogan; «Morning exercises»; «Who is stronger»; «Kangaroo»; «Grasshoppers», «Who is smarter» and relay. As expected, such competitions are always operated by the competent jury, where the Deputy Chief of the Military Institute on the ESLW Colonel Atabek Salikhbaev presided over it, the members of the committee were the chief of physical training and sports captain Miras Brimzhanov, teacher of the PTaS employee Baurzhan Doszhanov and women’s council and chairman of the Institute Colonel Albina Amanzholova. According to the results of all stages of the competition the third place was taken by the family of Mukhamedzhanova, the second by the family of captain Rakhimzhanova, the winners became the family of the deputy company commander of logistics BOUP ESLW Captain Ivan Khomutovskiy – his wife Natalia, son Yegor, their team was called «Friendship» and advocated under the motto «Sport, friendship and success – we will win today, and everyone!». All of them, as well as winners in the categories (stages) were awarded prizes. Holiday was a success — such «fun starts» unite the various categories of people, including military of different ranks — from the cadets and soldiers to colonels and commanders of units. Moreover, active involving the families of military personnel is very important here, because in real life, they almost do not know what their spouses and parents do in the service, because it is almost impossible to get into our military units. In addition, in those days — they are happy to come to see the performance of duty by the military personnel, to look at the military equipment and weapons. And as you can see, dear readers, they can even have the opportunity to take an active part in mass sports, cultural and leisure life activity of units of the National Guard of the Republic of Kazakhstan.